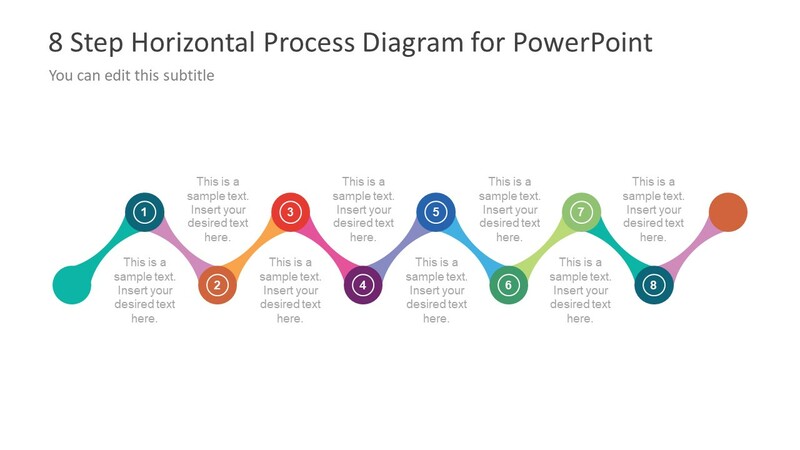 The 8 Step Horizontal Process Diagram Design for PowerPoint is an outstanding infographic template. 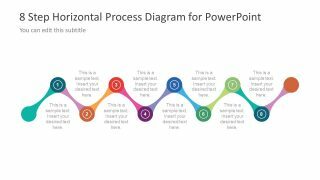 This PowerPoint template contain 10 incredible slides of unique connecting shapes which create horizontal process flow diagram. Here, the bone dumbbell shapes show the transition from one phase to another. 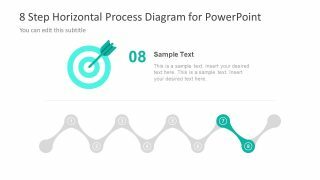 Hence, the connecting dumbbells in a zig-zag design can present the workflow ideas. 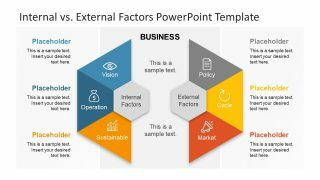 These visual graphics to display a work process, business model or phases in project planning are helpful in engaging audience. 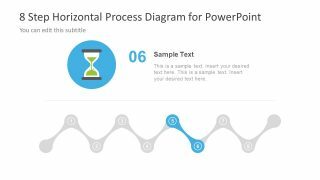 It is a simple slide forming an eight-phase horizontal timeline for business and management process flow. 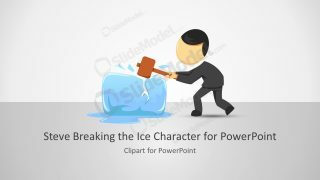 Therefore, it is ideal to use in presentation of project management methodologies, outlining the strategic plan or scheduling tasks. 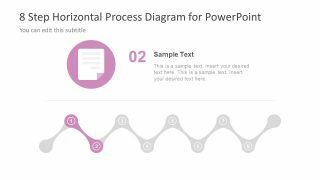 Moreover, the use of placeholders to represent each segment of 8 step diagram are practical for adding notes. 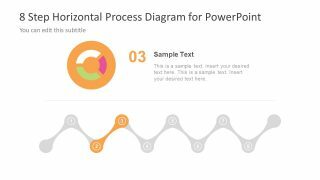 The 8 Step Horizontal Process Diagram Design for PowerPoint contains impressive infographics and vector illustrations. 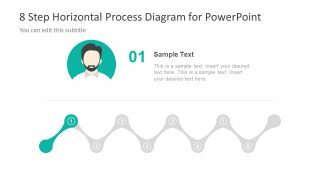 These circular graphic illustrations represent each step of horizontal process diagram. 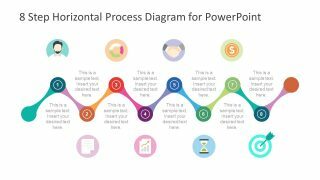 The template infographics include, user, report, doughnut chart, sales report, business deal, hour glass, dollar symbol and dartboard. Additionally, each of the 8 steps are numbered in the diagram. Further, rescaling these highly interactive visuals, will not affect the image quality. 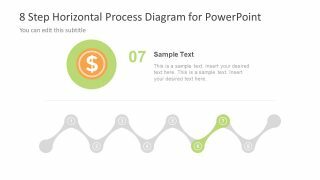 This editable horizontal process diagram template has layer of PowerPoint shapes which produce the gradient effect. However, the colors are changeable in shape fill option of format menu. 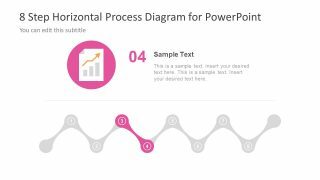 Similarly, the features like size, position, backgrounds and text placeholders are also editable elements with minimum effort. 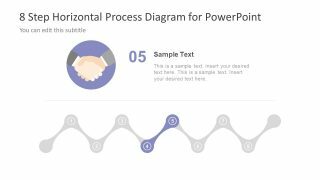 The horizontal diagram design of 8 step PowerPoint has two overview templates of zigzag process. One is a neat design of numbers, whereas, the other has visual infographic as circular icons. 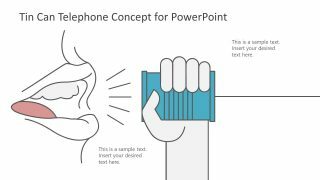 Furthermore, the next 8 slides highlight one segment of the diagram per slide. 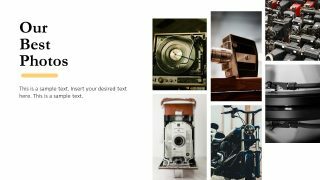 These slide templates provide users with the title and description placeholders to add useful information.